The ability to identify plant height across a field can serve as a very important tool in discovering problems such as compaction or tractor damage. Results compiled using imagery taken from a drone can be actionable in near real time allowing producers an opportunity to determine economic thresholds for late stage spraying or take periodic readings of the area to give crop scouts an indication of plant growth over time. Traditional methods to determine plant height can cost a significant amount of money and manpower, but with the implementation of these information-gathering tools, farmers will be better equipped to act on issues immediately and chart progress over time to optimize production. A major limitation to identifying and mapping yield-limiting factors in fields is the availability of appropriate on-the-go sensing technologies for plant growth. Evaluating plant height allows farmers to roughly gauge the success of the field. DataMapper monitors potentials based on the density and biomass that go hand in hand with the uniformity of a field. This information helps to plan for the next planting season based on the projected earnings of the current one. 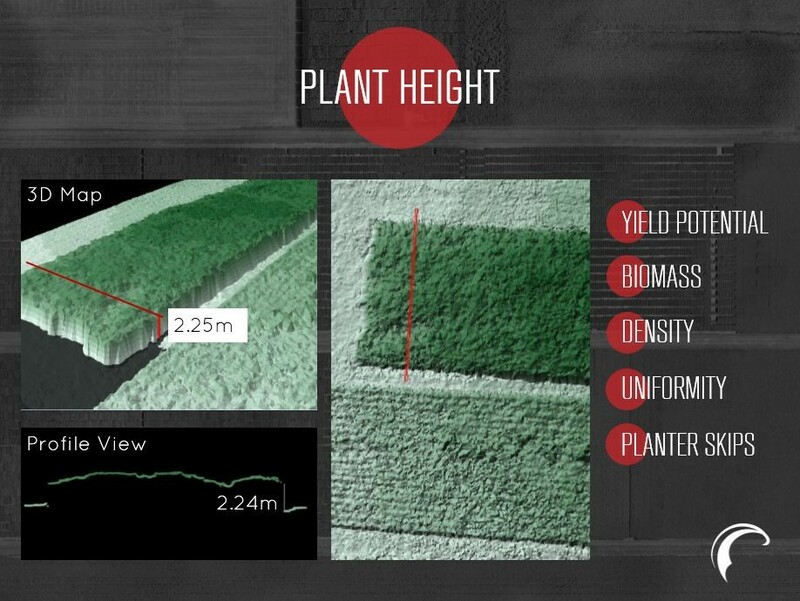 Measuring plant height can either be done using the multispectral or visual sensor, but a basic visual sensor can also be utilized, just like what we did to capture the image above. Here’s how it is being done. In the analysis required for the generation of the orthomosaic, we also generate a point cloud. Essentially, a point cloud is merely a collection of points in a coordinate system, each with an x, y, and z component, and they are meant to represent the external surface of the survey. Each point in this cloud, given that it has a z component, will carry information on the height of the surface of the survey, including that of the plots. The picture on the right is a top view of the densified point cloud for the survey. The top picture on the left is a perspective view of the point cloud focused on the plot that is being analyzed. The red line tells us which row of the plot we are specifically analyzing. The bottom left image is the profile of the row of plots specified by the red line and it tells us the heights of the plants in this row. Plant height assessment is important to farmers because they want to make sure that their plots grow in a uniform rate. When certain plants grow faster than others, they have the tendency to overshadow slowly growing plants, reducing their access to sunlight and turning them into weeds. Logistically speaking, assessing plant heights manually cannot be done completely. Farmers will simply analyze a segment of the plot and then extrapolate from this the condition of the rest of the field. UAVs solve this trouble by reducing the time and manpower needed for the analysis, saving the farmers the trouble of having to manually survey the field while, at the same time, providing more precise measurements. If it happens that height discrepancies occur for a planting season, and this can be completely assessed using data from UAVs, then the farmer must recalibrate his strategy for the following season. This could either be the redistribution of fertilizer to focus on certain parts of the field, the eradication of pests, the recalibration of water and fertilizer provision, and whatnot. And all these can be done in a much targeted manner because the farmer now has more precise information on the height distribution across the field.